First of all . . . no, I am not expecting. 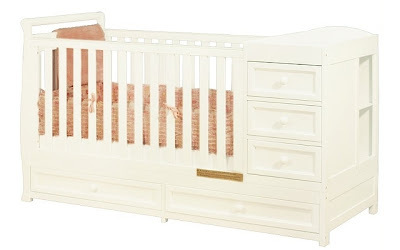 I saw this unique convertible crib and could not help but think, "Why did I not see this when shopping for a crib for our daughter 5 years ago?" 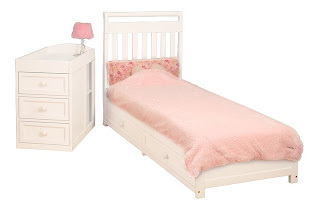 I think this convertible baby crib is unique because most turn into daybeds or toddler beds only, but this one turns into a toddler bed and a night stand. Aside from the actual ability to convert from a crib into two useful pieces of children's furniture, another feature I like about the AFG Athena Daphne 2-in-1 Convertible Crib is all the storage it offers in addition to a changing table on top. There is a built-in 3-drawer chest on the side, as well as two drawers underneath. There are even two cubby-type shelves on the side of the drawer unit, which would be perfect for books or a sippy cup of water for a toddler. I also like that the top of the newly-converted nightstand has a lip around it to prevent things from being accidentally knocked off. Someone I know needs to buy this! Maybe my sister or one of my cousins will have a little one soon?